Not so good photos from the bus window when driving through Jõhvi towards Narva but still something and also interesting for me. Looks like a modern building from around 1995. 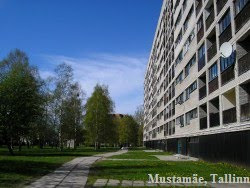 That older building is definitely one of the ugliest buildings in the whole Estonia. Such an eyesore! Nice, I'm not sure I have seen such before. More interesting blocks on the way out. Sinimäe blocks visible from a distance.